Most cyber professionals spend much of their time, effort and budget on protecting their corporate networks from an attack or breach. However, the reality is that most corporate data these days no longer lives only inside the perimeter of the network. Every business now uses the cloud to store and process data. Every business also shares data with its supply chain. Employees store data on their laptops and mobile devices and set up complex, unmanaged shadow IT networks of cloud apps and microservices. They email data within and outside the organisation, sometimes to the wrong recipient in error. The number one cause of data breach by far is our employees and human error, not failures of cybersecurity. Defending our network is no longer enough, so how can we defend our data? It all starts by reframing how we think about cybersecurity. This webinar explains why you need to beyond your networks to protect the thing that matters most — your data. Jeremy is the chief executive officer at RepKnight. Jeremy has 30 years’ experience in high technology industries, working at companies like Texas Instruments, Symbionics and Cadence. 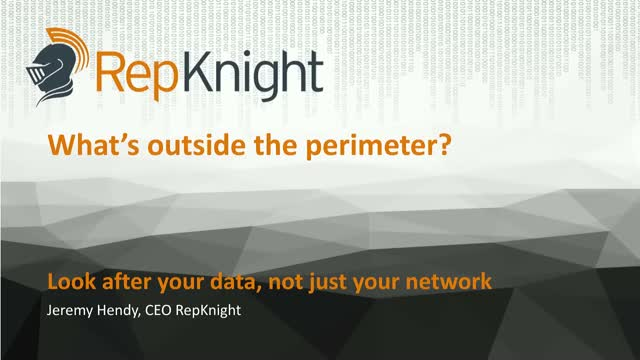 Prior to joining RepKnight in 2016, he was VP of sales and marketing at Cambridge-based Nujira. He holds a degree in electronic engineering from the University of Liverpool.